According to Jan Corning, our multi-tasking Vice President, “Everything matters.” Using her well-honed planning skills, she provides a safety net so that the project managers, architects, subcontractors, and homeowners all feel supported. “Almost any problem is manageable if you’re not surprised by it, so a big part of my job is to assess needs, confirm details, and keep confirming those details throughout a home building project,” she adds. 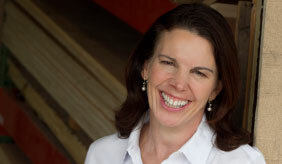 Jan joined our team in 1997 after more than a decade of work in construction management. She has since coordinated the pricing, purchasing, and staffing of our projects. “I have an incredible amount of faith in the people who work here. We are a committed group of problem-solvers who collaborate with our clients to ensure satisfaction all around.” A married mother of two who enjoys skiing and coaching soccer, Jan has high expectations of our staff. Her dedication to them results in service-oriented team members who enjoy their work. Jan explains, “Coming to work here is fun, and I strive to ensure that everyone will want to return for future projects.” Jan is an NAHB Certified Green Professional.